We’ve all know how a simple coat of paint can instantly change a room. 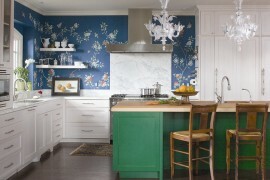 So it comes as no surprise that wallpaper can transform a space just as quickly. 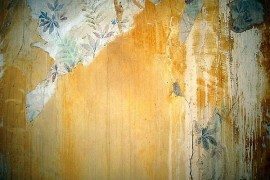 But long gone are the days where the decorative material is reserved just for the wall. Now you can let your creativity run wild- imagine tables, storage boxes, even closets renewed with fresh patterns and color. Tap into your DIY talents and spice up your home with one of these wallpaper projects. Don’t want to throw away those beautiful wallpaper scraps? These framed prints from Style at Home are the perfect solution. The white mat and frame allow the pattern to really shine, but don’t be afraid to match other colors for an eye catching look. 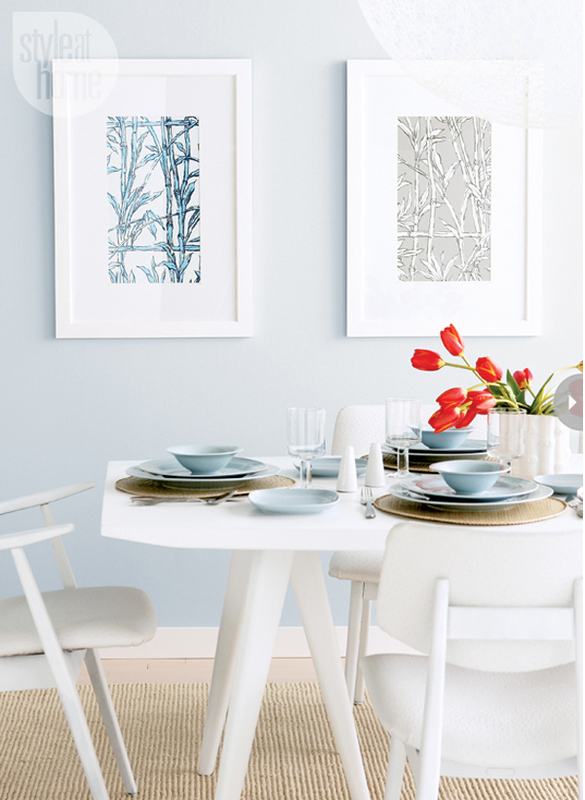 Displaying artwork is a great way to change up a plain wall without committing to a full wallpaper job. 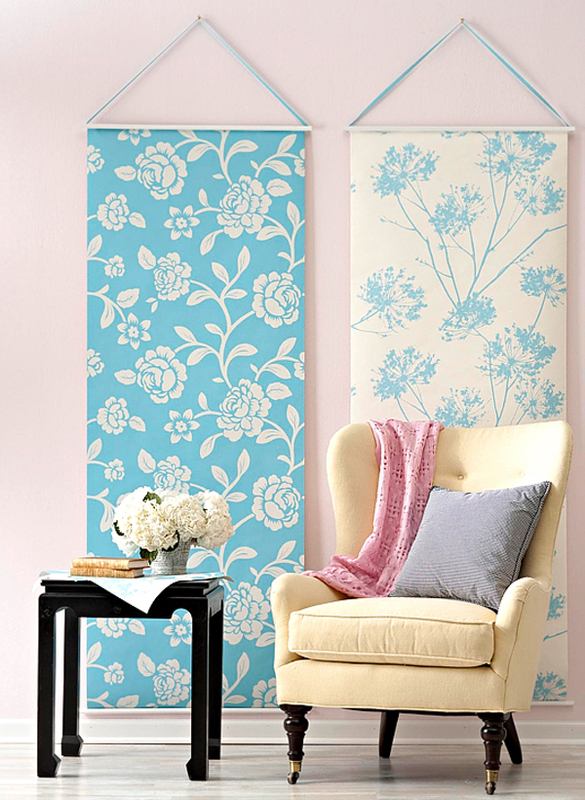 These hanging wallpaper panels from BHG will be one of the simplest projects you ever complete. Using dowel rods from your local craft store, wrap the two short ends of your panel and secure with glue. 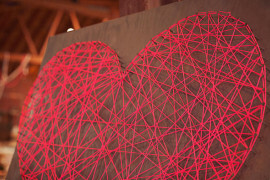 Hang using some ribbon and you have one-of-a-kind decor. Never use a tablecloth again with this project from Style at Home. 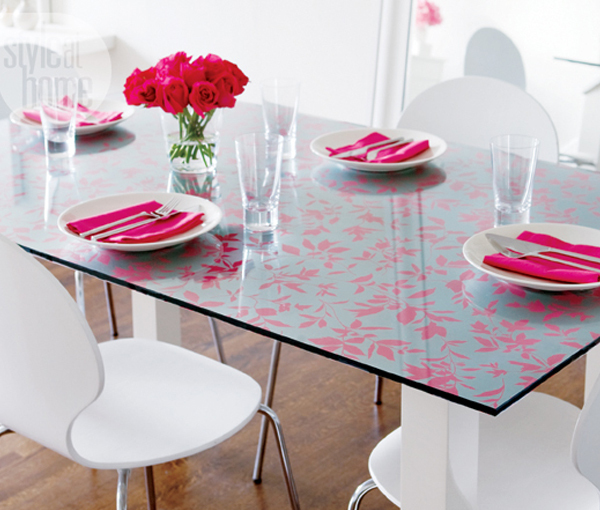 The gorgeous floral print under clear glass brings chicness to the dining room with minimal effort. Coordinating tableware add a nice touch and emphasize the posh blue gray and hot pink color combo. You’ve seen plenty of dresser makeovers that involve paint. Skip the typical approach entirely and opt for a clean, uniform look. 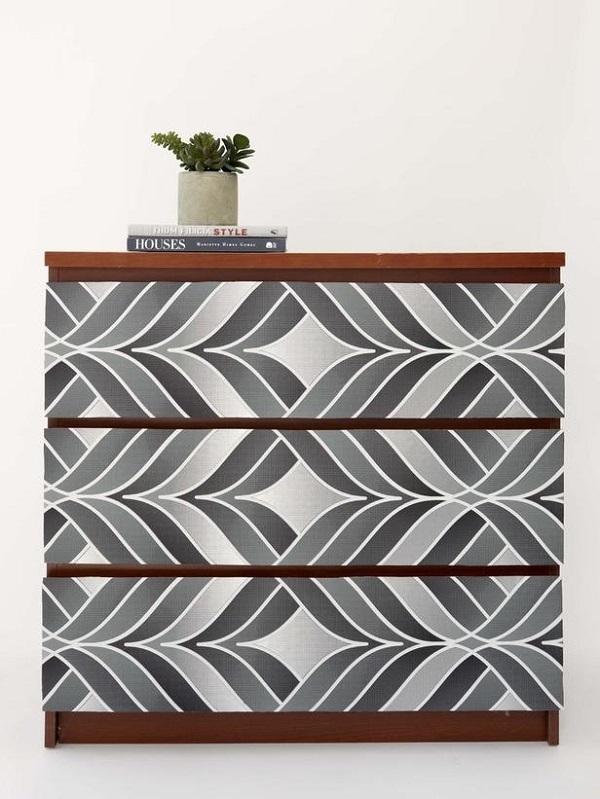 This dresser from HGTV shows that the right wallpaper can transform your project into the ideal modern showstopper outfitted in varying shades of gray. Slumber in style with this headboard DIY from HGTV. The pop of pattern in such an unexpected place makes for fresh and original design. Since the headboard is such a prominent focus, keep your walls and bedding relatively simple so your wallpaper creation can really shine. Combine function and style with this stunning floor to ceiling shelf display from Style at Home. While no one opposes gaining storage in their home, the added beauty of this black and white wallpaper offers a bonus- posh pattern. 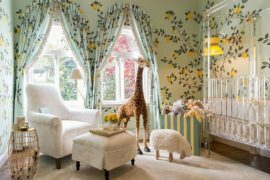 When choosing wallpaper for this project, try to find a pattern and that you’ll like for a few years and a color palette that is neutral. 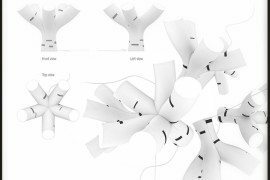 That way, if you change other elements of the space you won’t have to take down the shelves and start from scratch. 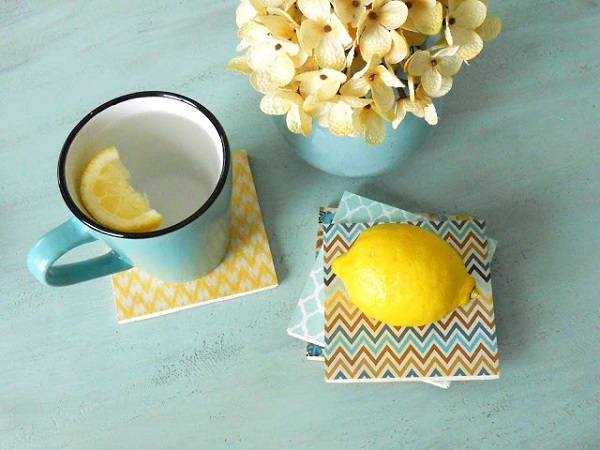 While coasters will save your beloved furniture from any liquid-related damages, they aren’t exactly known as the most stylish accents of the home. With this DIY by Jennifer from Delightfully Noted, you can turn that notion right on its head. Ceramic tiles get a colorful makeover with the addition of some remnant wallpaper or samples (you can buy both online or use from a previous project). Seal with polyurethane and you’ll be ready sip with joy. 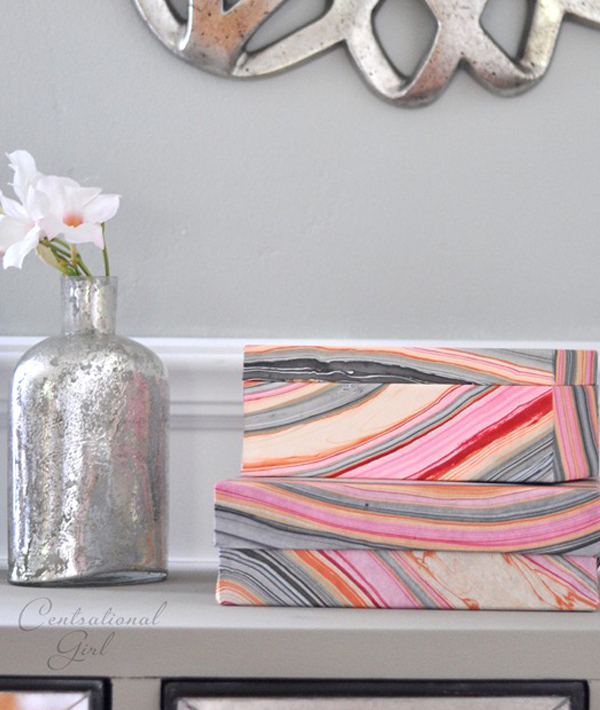 Kate from Centsational Girl made storage chic with these DIYed boxes. Covered in marbleized wallpaper, its color scheme of silver, orange and pink brings a fun, youthful vibe to a sophisticated space. 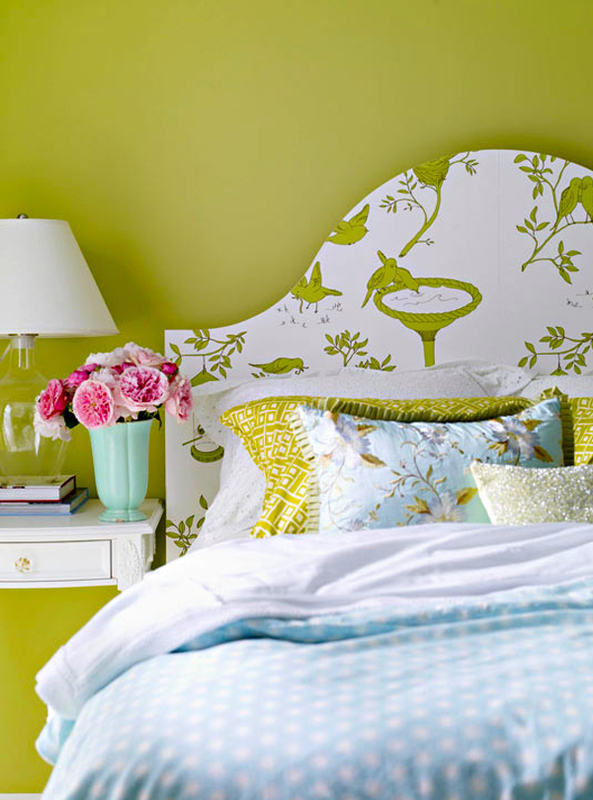 Save yourself effort without sacrificing the design impact with one of these wallpaper DIYs. A little certainly goes a long way in changing the feel of a room, from a tiny coaster to a backed bookcase. Do you have a creative wallpaper project right up your sleeve? Tell us about it in the comments below.